Rahul, is a Senior Advisor for Ontario Power Generation (OPG) currently supporting the Darlington Nuclear Refurbishment Engineering Program. 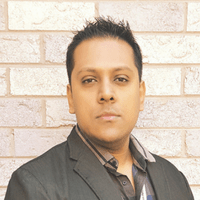 Rahul holds a Bachelors of Engineering (B. Eng) degree in Aerospace from Ryerson University and a Masters of Business Administration (M.B.A) from Aspen University. Rahul has over 10 years of experience within the nuclear industry. He started off his career in nuclear at RCM Technologies, followed by E.S Fox Ltd. and then OPG. Rahul has worked in many capacities; initially as project leader/modification team lead (MTL) on smaller modifications and soon progressed to Manager at E.S. Fox managing the Darlington Team of MTLs for the OPG portfolio. In his current role at OPG, he is involved in the planning and execution of performance/process/quality improvement initiatives required for the Nuclear Refurbishment Engineering Program. This involves the development and implementation of change management strategies while also providing lead strategic oversight on various aspects of the Engineering program. He is a professional member of the Project Management Institute (PMI) and The Institute of Leadership and Management (ILM).